Mark Anderson provided the soundtrack. 'Twas a beautiful summer evening, a perfect night for an art opening, visits with friends and suitable libations. Everyone who came out Friday evening to the Goin' Postal Summer Show was richly rewarded. What a talented community of artists we have here. Nearly everyone brought something new that was appreciated by all. Here are photos depicting some of what was on display. There was also a full slate of music including Marc Anderson, Theft By Swindle, Israel Malachi and a portion of Revolution Jones. If you wish to see some of the work here in person, and more, most will still be on the walls for the duration of this week at Goin' Postal in Superior, from 8 a.m. till 5:30 p.m.
One of many new pieces by Tara Stone. Dusty Keliin presented works in a new style. 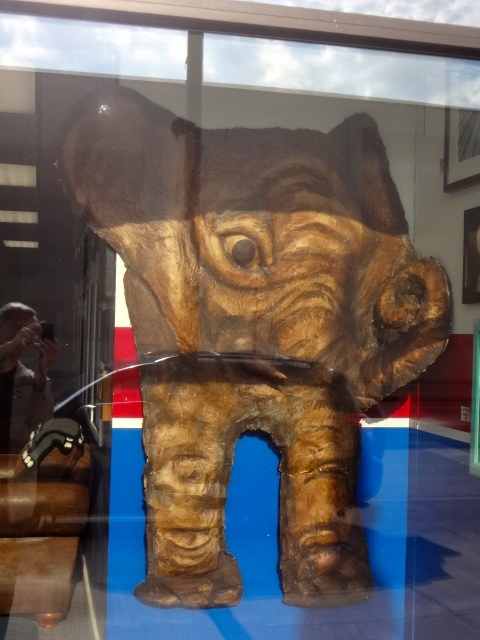 This is "Parr"
Two Mary Plaster pieces joined the show, one large (this elephant) and one small.